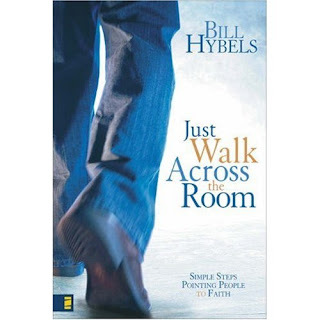 This fall our church has been reading a book by Bill Hybels, pastor of Willow Creek Church in Florida. We have really been challenged once again to take a look at those around us and encouraged to take a reality check. Who is it out there that really needs you? It is so easy to become so complacent in a world of affluence, but as I have traveled through the malls in my quest for finding the right Christmas decorations, I've been just looking at people's eyes and pondering to see if there is a flicker of light or hope. What effort does it take to drop some paper bills in to the Salvations Army's kettles? What effort does it take to pay the grocery bill for someone struggling financially in front of a line-up in your favorite grocer? What effort does it take to be kind to the uptight clerk at the till because her computer is frozen? What about in the Doctor's office or the Dentist office? What does it take to walk 10 steps across a room and this could point someone toward faith, it might just change the way you walk. It's Christmas time and just a few steps could make an eternal difference for some one. I always struggled being caught up with everything else, but I am asking God to give me a spirit that can take a genuine interest in another human being. It's so hard to step out of my Comfort Zone, but on Sunday I walked across the church floor and met a young lady and she asked for prayer. She was searching for a home church, for relationship and for work. What does that ask of me? YIKES! This seems overwhelming. What would you do? Sorry readers, I had a few network glitches. Marg, these are all such good reminders. Yesterday I stood and watched a young girl struggle with a torn receipt for me that she was trying to reprint. She was unable to print the gift receipts that I needed and in the end I pray that a return will not be needed since I didn't get that receipt. I think I was kind, I said the right words but I hope my body language agreed with what I said. Your post will help me to remember to take it that step further. I couldn't see the last pic and I'll pop by later to see if its cooperating for me. Timely words. Walking across the room isn't always the hard part...it's what to say when I get there! I can't see your last picture neither...some kind of glitch.